December is here and whether or not you’re like me and have been enjoying the Christmas spirit since last month, truth is Christmas is right around the corner. If you haven’t started your Christmas shopping yet, no need to worry. For all your different girl friends, here’s my 2018 Holiday Gift Guide with 7 gifts she’ll actually love! Planners make me so happy! Although I’m always on and off with my planner game, for 2019 I am determined to make complete use of it. Goals, goals, goals! I have so many goals set for this new year and I know staying consistent with my planner is going to be crucial for me. This #MomLife planner from the Happy Planner Super Mom collection just makes me smile. With so many other themes, you’ll find one that’s perfect for your friend (or yourself). Don’t be fooled by the low price tag, Barefoot is actually the most awarded wine brand and it’s easy to taste why. I love all pink wines but Barefoot is one of my favorites. From their classic Moscato to Prosecco, there’s something for all of your wine loving friends. A social enterprise to help people transition out of homelessness, The Giving Key pieces would be a gift that most girls I know would love. The idea is that you choose a word you need to work on and you wear it as a reminder. You will wear the key for as long as you need it and then gift it to someone who needs the word more. How amazing is that?! For the gym goer or for your friend who just likes pretty things and prefers to carry her own water, S’well insulated water bottles are a perfect choice. 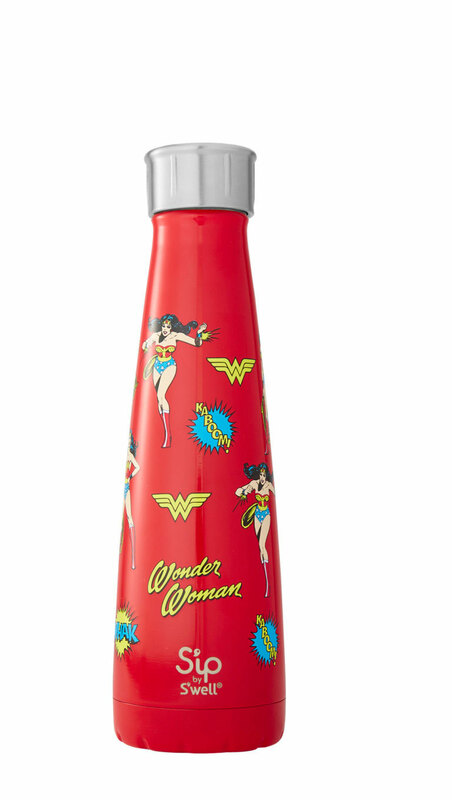 This Wonder Woman one, currently on sale, is my favorite! Also a plus is that S’well is a woman-owned business. We all need at least one book a year where you hear all the things you didn’t even realize you needed to hear. Reading Rachel Hollis’ Girl, Wash Your Face is like having one of your best friends at your fingertips. Rae Dunn mugs are a perfect gift for a coworker or friend who enjoys a fun mug. I started with my Queen mug at the office and have grown our collection at home by 4 new pieces including Argenis’ Fighter mug which instantly became his favorite. You can find these large letter pieces at TJ Maxx, Homegoods and Marshalls. You can also buy them online but for much more than if you’re able to find them at one of these three locations. For those friends who prefer an experience as a gift, a brunch for two is always a good idea. Can also be as simple as a manicure date or more relaxing like a spa day, depending on your budget. What are your favorite kind of gifts to get from a friend? You may also enjoy: 2018 Holiday Gift Guide for Toddlers and Family Holiday Traditions With Toddlers.